International Overdose Awareness Day (IOAD) is a global event held on August 31st each year and aims to raise awareness of overdose and reduce the stigma of a drug-related death. It also acknowledgesthegrief felt byfamiliesand friends remembering those who have met with death or permanent injury as a result of drug overdose." 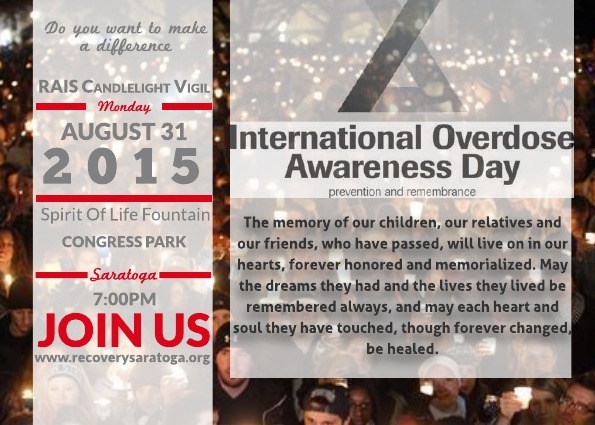 All are invited to stand with us as we lovingly honor drug overdose victims and their survivors while bringing awareness to this public health crisis. The memory of our children, our relatives and our friends, who have passed, will live on in our hearts, forever honored and memorialized. May the dreams they had and the lives they lived be remembered always, and may each heart and soul they have touched, though forever changed, be healed.